Okay, so who’s watching the royal wedding tomorrow? 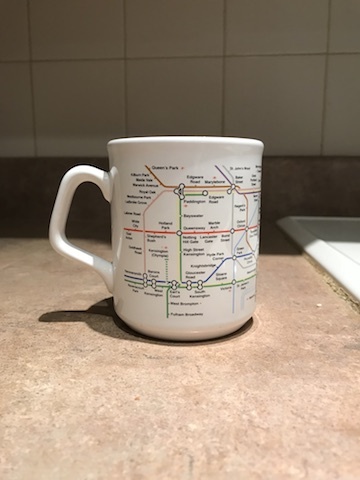 Hey, British wedding, British Tube teacup. Photo: Blogger’s own. The royal wedding of HRH Prince Harry and Meghan Markle promises to be quite the show. I’m going to have to get up super-early, but I want to see at least some of it. I’m glad for them. From what I’ve seen so far, both of them seem to be genuinely decent people. They also care about helping others who are less fortunate than themselves, which is inspiring to me. And you know, it’s being splashed all across social media. So I can catch up on any moments I miss. It’s long past time we had something good to watch on television. There have been so much ugliness in the news lately, it’s nice to have a change of pace and see a happy event. There will definitely be lots of pageantry. The Brits excel at that. I remember watching the wedding of Prince William and Kate Middleton, and it was well worth seeing. I watched as much of it as possible until it was time to leave for work and caught a little bit more while I bought an ice tea in the basement restaurant of my building. Do you have any special plans to celebrate? I’m hearing stories of special watching parties. I’m getting over a cough, so I’m going to stay in and have a modest cup of British breakfast tea to toast the happy couple. Maybe even dig up a crumpet somewhere (hello, Trader Joe’s). Good luck, Harry and Meghan! I look forward to seeing what you do in the future. Raising a glass (or a teacup, at least) to you. I’m watching! Probably on BBCA. Probably not from the very beginning. 5 a.m. is unfortunately too early for alcohol. I’m really TRYING to get excited about this, but not really making it. I’m not much of a royalist and I wonder how long before the divorce. Yep. I will watch and cheer! I watched but with a Starbucks coffee instead of tea. Imagine my surprise when my early riser husband already had it on when I got up. I love the hope that these events give especially at a time when the news seems to be all bad. I agree! It’s so nice to come together and be cheerful about something. I’ve only seen the highlights but hope to watch some of the actual wedding soon! I wouldn’t mind seeing some parts over again! Love the teacup! E and I went to a friend’s place to watch. I thought Meghan looked stunning and I couldn’t get enough of the floral arches. All so gorgeous. I am right there with you – we needed something happy to celebrate and they do seem like such a genuinely loving and caring couple. I think Diana’s spirit shines through both of them. They had some nice tributes to Diana. Forget-me-nots in the bouquet, music, etc. And the flower girls and pageboys were adorable. I’ll add to the chorus that it was lovely to have something nice to watch for a change, something to look forward to and enjoy. I think all the commentators felt that way, too. It was such an incredibly beautiful day in Windsor! The sunshine was glorious to see. They couldn’t have asked for better weather. I hope there was a breeze to cool people off!